As you folks out there know by now, we like guessing-games. 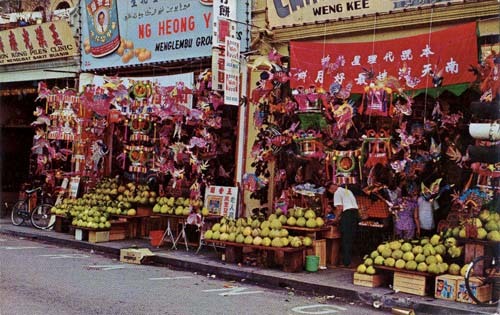 Here is a postcard from the 1980s, of a “busy street stall” in Ipoh, selling moon cakes, fruits, lanterns, etc. Now, all YOU have to do is tell us WHERE in Ipoh this street is (truth is: we aren’t sure ourselves!). No prizes for guessing, just think of it as another way to get to know Ipoh better! The only clue is the clinic on the far left, which I can’t read. Do take note of the word PARKING is written on the road as well. I doubt we’ll be able to guess the street’s name. Bob, the clinic on the far left is a piles-clinic called ‘? Kong’. Don’t know if it’s still there today. have a gut feeling this place cud be at Menglembu , judging by the groundnut signboard !!! The postcard says the place is in Ipoh. We think it’s probably Cockman Street, where a similar group of shops are today. Of course someone out there might know better! OMG.. i feel like i pass by this place before when im young.. Is it the shops in front of super kinta last time? OK. I have checked with some long term residents of Ipoh who tell me that there has always been a group of shops like this in Cockman Street close to the New Market and Super Kinta. So Jen, I think you are right and these are the shops you used to pass by when you were young. There are of course still four shops that sell these same things in the same place today although none of the names match with those on the postcard. So we shall stick with Cockman Street unless someone knows better! hi guys.. but those shop sell burning papers and ching ming items…not ground nuts…..yes they do sell mooncake festival lanterns…..do you notice the floor of this shops to the tar road is very low compared to now which u have to climb steps up? Don’t know exactly where it is,but if felicia is correct about the Piles clinic?it must be close to the River where they would use them for building Piers and Jetties and the like…for boats and maybe dredges to tie up to? The name of the “piles”clinic is Wong Hon Kong in Chinese. Looking at the balcony above the clinic and those pillars, I agree with Estee that most probably these shops with the low front and no steps are along Hugh Low Street. For Jim, these piles are on the backside Not the riverside! Hi all, I must say you guys are pretty good at guessing games! So, it’s a toss between Cockman Street and Hugh Low Street then (care to flip a coin?). Thanks for the feedback, Keep it up guys, it’s fun hearing from all of you! No need to apologise I thought it was really amusing and therefore tried to respond in the same vein with my idea of humour. My husband says never tell a joke to a Malaysian as they will not understand the English brand of humour. Perhaps it is also the same the other way around! Whatever, do keep posting comments as I enjoy reading them. Well done Kit! I shall drive round to look for it. Jim, I truly enjoyed your joke! Thanks. Hi Kit. WOW……you still remember those shops! Great, thanks for the info. That’s a very interesting piece of information. Thank you for sharing it with us. I shall have a look at the area soon and see if there are any clues left. Those two shops were gone long ago but I remember them very well because my parents usually purchase pomelos and groundnuts there whenever we have visitors from out of town. Kit is absolutely correct with regards to its location. The two shops were located near the intersection of Hugh Low Street and Anderson Road. Thanks for the info, Ken. Welcome to our blog! Hi Ken, How nice to see you back again on ipohWorld. Do visit us regularly, there is always lots to see and comment on. Ken, we went and had another look at your suggested site of the shops and we are sure you and Kit are both correct. Although names have changed and the pillar characters have been destroyed we intend to go back during the day to see what we can learn about the shops’ demise. Will keep you posted. My dad just confirmed with me that this is Hugh Low street. The 2 shops were opposite Hai-O, very near to the corner… Hugh Low Street used to be 2-way and the parking sign was part of the road during those days. Hi Jeremy…thanks for the update! Dont know where this pic was taken, but this is how I remembered Ipoh in the 60’s till I left in 1970. I miss Ipoh ~ Love this website ! The two fruit-shops were iconic landmarks of Hugh Low St. for many years during the 60s and the 70s. Unfortunately, it couldn’t escape the tidal wave of change that swept through Hugh Low St. beginning from the early 80s. Hugh Low St. had now lost the status as the main shopping centre of Ipoh. Hi Peterpan…welcome to the blog! OK old girls of Raja Perempuan, Elaine has thrown down a challenge. Anyne out there happy to pick it up? If not, but you come from Raja Perempuan, at least let us know and we can put you in touch with each other if you would like to. Elaine, welcome to ipohWorld, do you have any memories of growing up in Ipoh you would like to share with us please? A look at http://www.ipohworld.org/blog/?p=1878 will explain why I ask. I’ve just discovered this blog, find it very interesting. Yes former RPS girl, wld very much like to get reconnected with old schoolmates. Its like 38yrs ago!! Where are they now…. I’m now Dutch, living in Holland for the past 22 yrs,& I do miss Ipoh my hometown. Do I’ve any memories of Ipoh to share with? Yes off course, plenty….but I need time cos I’ve my own shop and being in the retail biz, is very time consuming and off course a family to take care of too. I’ll try to write during weekends. We are happy to hear that you find our world interesting. Thanks for agreeing to write something down for us. We look forward to receiving your memories in due course. I shall see if I can help you connect with some of the Old girls. There must be someone out there who was from Raja Perempuan. I’m an old girl of RPS and the principal then was Mrs Nadarajah. My last school year was 1977. RPS is no longer like it used to be with an ‘English-speaking’ environment. Nice to know there’s an RPS girl out here at Ipoh World!